Multitel has developed an expertise in the field of Intelligent Transport Systems (ITS). This expertise is oriented on the one hand towards the problem of the last mile carried out in urban areas and on the other hand towards the validation of standardized messages transmitted between vehicles and route infrastructures. Regarding the problem of the last mile in urban areas, Multitel has participated in the development of various technological platforms. These platforms link the players in the logistics chain in order to optimize their movements in urban areas, thus contribute to the decongestion of urban traffic. About the validation of standardized messages in the ITS sector, Multitel’s expertise is based on the knowledge acquired within the Railway Certification Department. This validation verifies the conformity of the format of messages according to the standards that have been defined within specialized institutions. This validation allows the different ITS systems to be interoperable and therefore to be cooperative (C-ITS). Multitel is a neutral non-profit organization in Belgium ideally placed to provide independent interoperability testing services. 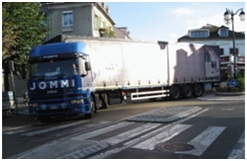 UrbanWise (www.urbanwise.be) : The goal of the UrbanWise project is to propose solutions that reduce the negative impacts of urban freight transport. Freight transport in cities is essential for the viability and economic development of cities, but also causes many economic, environmental and social difficulties. Open IT tools can contribute to a better logistical efficiency and the promotion of new urban logistics services. UrbanZen : The project proposes a collaborative solution that allows to participate in the decongestion of urban traffic. It is based on the centralization of information from both the drivers themselves and the local authorities. The aim of this solution is to obtain from carriers the indications of the existence of black spots, through transmitting information by a simple and minimally invasive mechanism, and comparing it to the computerized and updated real time digital mobility plans provided by the municipal administration. 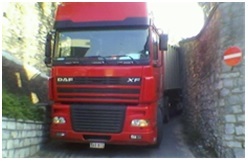 The feedback to drivers is given directly via the GPS which is available in majority of the trucks. This allows the automatic rerouting by the calculation of a specific “bis” route that is compatible with the constraints emitted by the municipality managers.